The defendant is a guy who performed a similar trick on YouTube and offered to reveal the secrets for a price. The video was removed after Teller sent a takedown notice. Teller of Penn & Teller fame is suing Dutch entertainer Gerard Dogge for allegedly ripping off his copyrighted magic piece called Shadows. Dogge, whose stage name is Gerard Bakardy, has showcased his own illusion called The Rose & Her Shadow in a YouTube video and allegedly offered to reveal the secrets for $3,050. Teller says he realized that it was a copy of Shadows, called Dogge on the phone and offered money if Dogge didn't disclose the mechanics of the illusion. The two couldn't come to an agreement, however, so Teller is now suing in a case that could help determine the level of protection that magicians have over their tricks. The lawsuit was filed Wednesday in federal court in Nevada, where Penn & Teller live and perform. Teller sues as "Teller, an individual" in the lawsuit and doesn't give his full name, though records attached to the complaint break some of the mystery by showing the action was brought by Raymond Teller. “Shadows essentially consists of a spotlight trained on a bud vase containing a rose. The light falls in a such a manner that the shadow of the real rose is projected onto a white screen positioned some distance behind it. 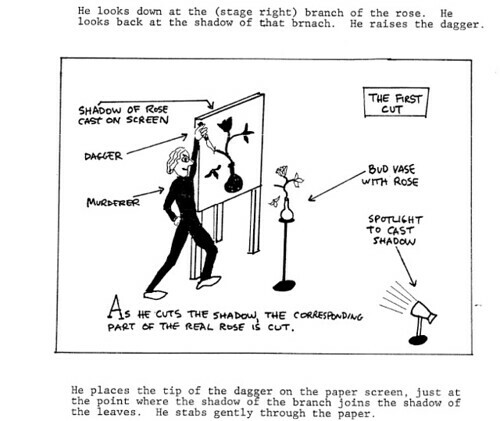 Teller then enters the otherwise still scene with a large knife, and proceeds to use the knife to dramatically sever the leaves and petals of the rose’s shadow on the screen slowly, one-by-one, whereupon the corresponding leaves of the real rose sitting in the vase fall to the ground, breaking from the stem at exactly the point where Teller cut the shadow projected on the screen behind it. Upon information and belief, the magic trick Shadows was the first illusion of its kind." Magic tricks are indeed copyrightable as "pantomimes," and the magician's chief challenge in this regard is making sure the works are "fixed in a tangible medium of expression from which the work can be performed," as the U.S. Copyright Office requires. "The mere fact that both The Mystery Magician and the Specials reveal the secrets behind magic tricks does not by itself constitute infringement. Rice's claim, therefore, may only succeed if the Specials infringed upon the presentation and stylistic elements of The Mystery Magician." The appellate circuit confirmed the specials hadn't. In Teller's lawsuit, the Shadows magic trick is described as having an "iconic quality" and being the "oldest, most venerated piece of material in continuous use in Penn & Teller's Show, and while other material has come and gone, it has remained as a universal favorite." The Dutchman is said to have recorded a video of himself performing his work called The Rose & Her Shadow and posted it on YouTube. Underneath the text of the video, the defendant admits he has “seen the great Penn & Teller performing a similar trick and now I’m very happy to share my version." The YouTube video was posted with an advertisement offering to sell the magic trick to consumers. Teller says he became aware of it March 15 and instructed his attorneys to send YouTube a DMCA takedown notice. A week later, Teller contacted Dogge by phone and requested that he cease all use and offers to sell the work. Teller offered to pay, but Dogge allegedly refused the terms, counteroffering a larger sum, which Teller rejected. So now Teller is suing for copyright infringement and unfair competition, seeking a declaration that the work is infringing, a permanent injunction against Dogge's use, and demanding damages. He is being represented by Mark Tratos at Greenberg Traurig. Will Teller win? Hard to say. Showing substantial similarity in Dogge's act to what he wrote down nearly three decades ago will be a chore. But at least he had the foresight to make the effort of fixing his work in a tangible medium of expression and filing a formal registration, which is probably more than what 99 percent of other magicians out there do. Surely there are plenty of folks who believe magic shouldn't be copyrighted. But If he's successful here, it might be the best trick he's ever pulled off.